Given Daniel Agger’s track record with injuries, this piece could just as easily be titled ‘The accidental hero’. That would have been harsh, given his talent and loyalty. The ‘YNWA’ tattoo on his knuckles, and steadfast refusal to sign for Liverpool’s rivals, endeared him to the Kop, and ensured him folk hero, if not legendary, status. Liverpool have now confirmed a cut price move to Agger’s boyhood club Bronby. Agger, signed by Rafa Benitez in 2006 for the relatively modest fee of £6 million, is one of Liverpool’s most experienced players. At 29 he still has lots to offer. However, he is also one of the clubs highest earners, meaning they are unlikely to be too keen on having him warm the bench this season. To be fair, Daniel will justifiably argue that a player of his quality deserves to be playing football on a regular basis. Alas it is regular football that has proved depressingly illusive for the Dane. Since he joined eight years ago, Agger’s career has been hampered by injury. He has managed 232 appearances for the club, a figure that should be far higher, given his talent. Agger’s ability to bring the ball out of defence reminded Reds, of certain vintage, of Alan Hansen. He was also fierce in the tackle, as a certain Fernando Torres found to his cost. He also possessed a fierce shot, and his screamers against West Ham and Blackburn Rovers will live long in the memory. Then there was the pile driver against Chelsea, in the 2007 Champions League, semi-final, second leg, at Anfield. This was a goal that set Liverpool en-route to their second final in three years. Perhaps, in years to come, he will be viewed as a legend by the majority of fans. He has certainly embraced the spirit, history and ethos of the club. He has scored important goals and made crucial tackles. However, Agger’s quietness and reluctance to step into the limelight, mean he would probably be uncomfortable with such a status. Who can remember the uncomfortable interview he gave to Claire Rourke, on the clubs channel? It was an awkward affair, and it was painfully obvious that the defender would rather be anywhere else, than in front of that camera. It’s an endearing quality. Football is an industry filled with egos bigger than Steve Bruce’s head. However, I can’t help wondering if this reluctance to be the star is significant. When Jamie Carragher hung up his boots at the end of the 2013-14 season, the club was crying out for a domineering centre back to fill his boots. Carragher was perhaps one of the most vocal defenders in the game. He constantly harangued his team mates and wasn’t afraid to mix it up when necessary. His clash with Alvaro Arbeloa has long since entered Liverpool folk-lore. Agger, as one of the clubs longest serving defenders, could and should have been the natural successor. He has the footballing brain to organise the back four, he could be fierce in the tackle when needed, and he had he also possessed a goal threat from set pieces and distance. However, I will always wonder whether it was an inability to be the main man at Liverpool, that prevented him from taking that step. 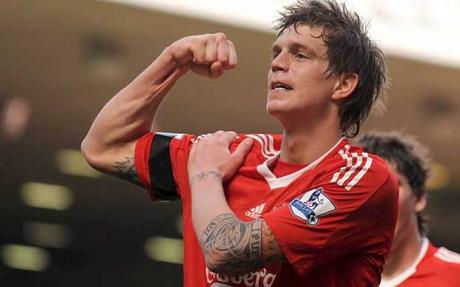 Agger will return to Denmark a true Bronby legend. They are getting a player of the highest calibre, with vast experience at the highest level. I, and all Liverpool fans will be hoping that he achieves the success he deserves. Good luck Daniel. You will never walk alone, but you already knew that.